A major portion of mainstream media as well as alternative media continue to ignore or under report on the ongoing potentially catastrophic situation in and around the Bayou Corne (Texas Brine LLC) collapsing Sinkhole #3. 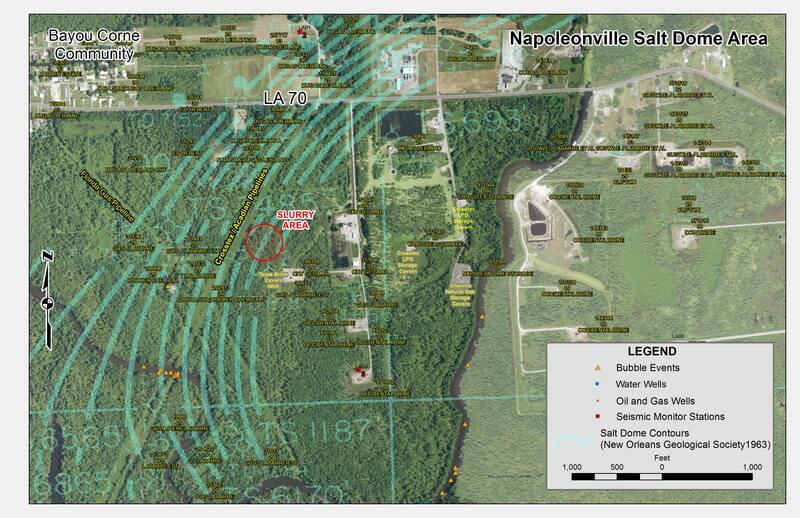 DNR Incident Area Map - Napoleonville Salt Dome A quick search on Google maps above indicates the Assumption Parish, Bayou Corne Sinkhole is also within 60 miles of Waterford & Riverbend Nuclear Power Plants and within close proximity of major population areas of Baton Rouge and New Orleans LA. Napoleonville Salt Dome is comprised of up to 23 separate caverns many used for storage of volatile materials such as Liquid Butane by companies listed on LA DNR website at (See Emergency Orders pdf). It was confirmed during a Press Conference: Cavern below sinkhole has failed… and collapsed — Collapse may be ongoing (VIDEO) and 30 to 50 feet of land was swallowed up by ever expanding sink hole as new bubbling is now being reported as far as 3 miles away. But those collapses have sometimes had dramatic results, such as the collapse last month that pulled down a tree and a boat. Two cleanup workers in the boat escaped before it went down. A 1,500-square-foot section of earth caved in from the edge of a slurry-filled sinkhole near Bayou Corne in Assumption Parish on Tuesday night, pulling down with it several trees and part of an access road, officials said Wednesday. The road was built as a place for parking excavators that will be used in the pending cleanup of the sinkhole, which emerged Aug. 3 in swamps between the Bayou Corne and Grand Bayou areas on property owned by Texas Brine Co., parish officials said in a blog post. The sinkhole — filled with a liquid mixture of brine, mud, vegetative matter and other substances — has forced the evacuation of residents in 150 households in the two communities. Excavators were not present on the road when the collapse happened, said John Boudreaux, director of the parish Office of Homeland Security and Emergency Preparedness. The 4-acre sinkhole has undergone periodic edge collapses and has gradually become wider as the saturated soil on the edge falls into the slurry hole. Estimates before the most recent collapse put the sinkhole’s width at 475 feet. State Department of Natural Resources and Texas Brine officials have said the sloughing-off process is expected to continue as the hole finds its level and becomes shallower. The latest collapse, which took down an area 30 feet by 50 feet, happened on the southeast rim of the sinkhole, which had seemed stable until part of it sloughed off Tuesday, parish officials said. Sonar testing results of a damaged Texas Brine salt cavern and samples of material found in the cavern are being analyzed to better understand what happened to the cavern suspected as the cause of the sinkhole. Testing of hydrocarbon liquids from a Texas Brine investigatory well into the cavern may provide a definite link between the cavern and the sinkhole. Another location where natural gas bubbles to the surface of area waterways emerged and samples of its gas emissions have been captured for testing. In announcing their cavern sustained damage, Texas Brine officials said Monday that a tool used to measure the depth of the underground cavern found its floor is 1,300 feet shallower than when it was plugged and abandoned in mid 2011. That new, shallower point is 4,000 feet underground. Parish and Louisiana Department of Natural Resources officials are trying to get a better idea about the nature and amount of material found Monday inside the 20-million-barrel salt cavern, said Patrick Courreges, DNR spokesman. Also, Boudreaux said Tuesday that a sonar scan of the salt cavern has been completed but results were still being analyzed. Sonar tests of the cavern were conducted through the investigatory well into the cavern. Texas Brine’s contract driller finished the well Saturday, enabling experts to test the cavern’s depth. Courreges said Texas Brine and Office of Conservation personnel are conducting independent tests of samples taken from the material in the cavern. Texas Brine said the material is not consistent with brine operations. Courreges also said the Office of Conservation is still trying to determine what link may exist between the cavern damage and the sinkhole. The underground cavern, shaped like a narrow, upside-down flower vase, extends from a depth of 3,400 feet to a depth of 5,650 feet underground. Its edge is about 200 feet southeast of the sinkhole. DNR scientists have said they suspected that the cavern failed, allowing its brine contents to gush out and open up the sinkhole. The cavern was hollowed out of the 1-mile by 3-mile Napoleonville Dome after nearly three decades of use for brine production. The dome is a solid salt formation that emerged from deeper deposits left by ancient seas and has been used for oil and gas exploration, brine production and hydrocarbon storage for decades. Chris Piehler, Louisiana Department of Environmental Quality Inspection Division administrator, said this week that samples pulled from the investigatory well may enable investigators to make a connection between the cavern and the sinkhole. He said DEQ collected samples of the gas and the hydrocarbon liquids and plans to do “fingerprinting” analysis of the liquids to compare them with the diesel range hydrocarbons previously collected from the surface of the sinkhole. A similar event in 2008 occurred when New Mexico experienced two sudden and catastrophic brine well cavern collapses within a four-month period that led to the formation of massive sinkholes. The first, at Jim’s Water Service, occurred on July 16, 2008. The second, at Loco Hills Water Disposal Company, occurred on November 3, 2008. A final report issued in 2009 on Brine Well Collapse Evaluation Report apparently using a similar drilling process known as Reverse Circulation Drilling.